Three stars of hit BBC sitcom Mrs Brown’s Boys diverted more than £2m into an offshore tax-avoidance scheme, Paradise Papers documents show. 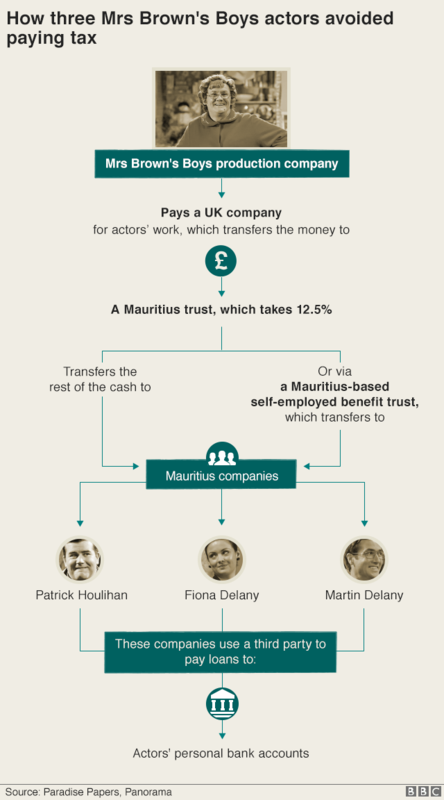 Patrick Houlihan and Martin and Fiona Delany transferred their fees into companies in Mauritius and sent money back as loans. Similar tax avoidance schemes have been subject to investigation and challenges by HMRC in recent years. The actors have not responded to the BBC’s requests for comment. Houlihan told the Irish Times he had joined the scheme after receiving professional advice without fully understanding it. 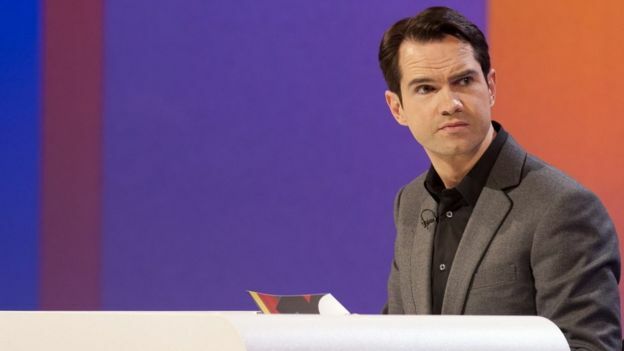 Roy Lyness, who put the stars in touch with the advisers behind the set-up, was the accountant behind the similar K2 tax avoidance scheme used by comedian Jimmy Carr. The revelation in 2012 that Carr had used a Jersey-based tax shelter attracted criticism from then-Prime Minister David Cameron. It led to the comedian saying he had made “a terrible error of judgement”. The leaked documents held by offshore law firm Appleby show how the three Mrs Brown’s Boys stars put their fees from a production company owned by Brendan O’Carroll, the creator and star of the show and real-life father of Fiona Delany, in companies they controlled in Mauritius. Mr O’Carroll said neither he nor his companies have been involved in a tax avoidance scheme or structure and the actors’ wages were paid into a UK company bank account. Mr O’Carroll’s production company is registered at accountant Mr Lyness’s office in Oldbury in the West Midlands. Mr Lyness said he was “bound by client confidentiality as well as duties under the Data Protection Act not to divulge confidential information concerning my clients’ financial affairs”. Mr O’Carroll plays Irish matriarch Agnes Brown in Mrs Brown’s Boys. Patrick Houlihan is one of the boys – Dermot. Fiona Delany stars as Mr Houlihan’s nurse wife Maria, and her real-life husband, Mr Delany, stars as Trevor Brown, the youngest son. The sitcom started life as a radio show on RTE 2FM in the Irish Republic and became a worldwide hit after being turned into a TV series by the BBC and RTE in 2011. There is also a successful stage show which tours the world. A film, Mrs Brown’s Boys D’Movie, came out in 2014, and the show’s Christmas specials are among the UK’s top-viewed festive programmes. 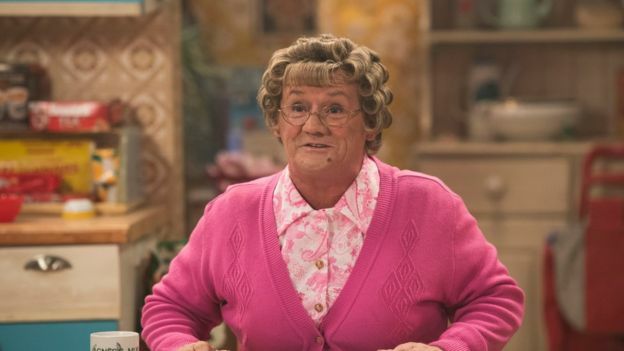 The Paradise Papers documents suggest the actors’ fees from their work connected to Mrs Brown’s Boys was sent offshore to avoid income tax and national insurance. the loans had been structured to avoid triggering rules brought in by the UK government to prevent similar schemes from operating – with the money paid into the accounts through a third party. Documents for the 2014-15 financial year show Martin Delany’s offshore company received £448,095 and Fiona Delany’s received £448,168. No figures are available for Paddy Houlihan, as his company’s accounts for that period are not in the data. But a spreadsheet for the next financial year shows in December 2015 Mr Houlihan’s company had assets of £696,349, Fiona Delany’s £715,122, and Martin Delany’s £725,030. In official guidance issued in 2016, HMRC said it would investigate and challenge such practices. “Scheme promoters will tell you that the payment is non-taxable because it’s a loan, and doesn’t count as income,” it said. “In reality, you don’t pay the loan back, so it’s no different to normal income and is taxable. HMRC has the power to send people using these sorts of schemes “accelerated payment notices” – which require them to repay the tax immediately, while their case is investigated. In a statement on the Paradise Papers leak, Appleby said it was a law firm which “advises clients on legitimate and lawful ways to conduct their business. We operate in jurisdictions which are regulated to the highest international standards”.